Located in Barcelona’s charming old town district of El Borne, the European Museum of Modern Art, better known as the MEAM, is housed in Palau Gomis, a lovingly restored 18th century Renaissance-style palace hidden among the rows of tightly-packed historic buildings lining the enchanting narrow winding streets one loves to get lost in. The MEAM is operated by the Fundació de les Arts i els Artistes—Catalan for the ‘Arts and Artists Foundation’—which is a privately funded initiative that promotes 20th and 21st century art. The Foundation’s raison d’être is to counteract the tunnel vision marketing of abstract and modernistic art by powerful tastemakers and art speculators, in order to support figurative (i.e., representational / realist) artists who are often automatically excluded from official initiatives. The MEAM’s goal is to encourage present-day expressions of art using contemporary language while honoring traditional artistic skills, and it differentiates itself from other contemporary museums by actively supporting the living artists whose notable works it collects and/or exhibits. Since its opening in June of 2011, the Museu Europeu d'Art Modern—this is its official Catalan name—has linked tradition and modernity, unquestionably becoming a must-visit place for art lovers. The MEAM’s prestigious collection currently includes more than 1500 works of art by 300+ artists hailing from five different continents, not only illuminating the diversity of contemporary artistic expression within the realm of realism but also reminding the world that modern art need not be devoid of beauty, artistry, meaning, or craftmanship. Read more about Heldens and his art HERE. On Friday night September 22nd at 8 pm the inauguration took place of Figurativas 2017, the 9th edition of this highly prestigious biennial Painting and Sculpture Competition, an international exhibition showcasing realist paintings, drawings, and sculptures. Earlier that day, before the crowds poured in, I wandered through the deserted exhibition space marveling at a remarkable array of exquisite artworks, and enjoying the intimacy and quietness the museum offered. There were so many pieces that drew me in, so many details I wanted to study up close—I felt overwhelmed at seeing so much beauty and felt frustrated at not having enough time to give each piece the attention it merits. That Friday evening, the well-attended awards ceremony was hosted by José Manuel Infiesta, director of the MEAM, and Tomás Paredes, president of the Association of Spanish Art Critics, with many of the participating artists and hundreds of guests in attendance. The room was completely filled with people—standing room only—while the director gave an impassioned speech and announced the winning artist and ten honorable mentions who all received framed certificates for their accomplishments. Read more about Eichenberg and his painting HERE. An art enthusiast since his early teens, Infiesta became an architect by profession but also studied art history, published books and magazines about art, music, and ballet, and has always been deeply devoted to the arts—from opera and ballet to painting and sculpture. Around the year 2000 he started collecting art, and in 2006 initiated the Arts and Artists Foundation which eventually led to the creation of the MEAM, which specifically seeks to steer contemporary art away from the abstract and back to representational art in order to give it the prominence and respect it deserves. The MEAM rotates its exhibited art every two months, showing new acquisitions as well as collection pieces, making sure that the public can visit the museum about ten times a year and never see the same display twice. Moreover, the MEAM actively engages the public, artists, art students, and art lovers by holding workshops, conferences and round table discussions, and also hosts 150 classical, jazz, and flamenco concerts a year. The MEAM is undoubtedly a place where the arts come together and it does indeed feel like a home for the earnest realist artist. The MEAM is also closely affiliated with the Barcelona Academy of Art, which offers a variety of art courses where the classic academic approach is seen as a tool that students can use to build their own creative personality and artistic language. About 80% of its pupils are foreigners, demonstrating that there’s a thirst among art students worldwide to learn the time-honored skills and methodologies no longer offered in most of today’s educational art institutions. The jury of the IX Prize for Painting and Sculpture Figurativas 2017, was composed by J.M. Infiesta, Alex Kanevsky (Russian artist), Daniel Graves (US artist and founder of the Florence Academy of Art), Antonio López García (Spanish artist), Nicola Samorí (Italian artist), Leandro Navarro Ungría (Madrilenian gallerist), and Tomás Paredes (art critic). These seven men selected painting finalists from 1386 entries by painters from 68 countries and sculpture finalists from 272 submissions by sculptors from 35 countries—a monumental task. Infiesta is obviously used to being criticized, especially on his stance regarding abstract and modernistic art, so he doesn’t feel particularly impressed by those who complain about the conspicuous gender inequality of his selection of this year’s jury. Softening a little, Infiesta insists his choice of jury is not in any way an expression of his view on women, which indeed he admires and wants to include. In fact, he invited artist Lita Cabellut for jurying but, unfortunately, she became ill and had to decline coming to Barcelona to sit on the jury. Over time he has invited several other prominent women artists, including Jenny Saville, none of which even responded to his invitation. 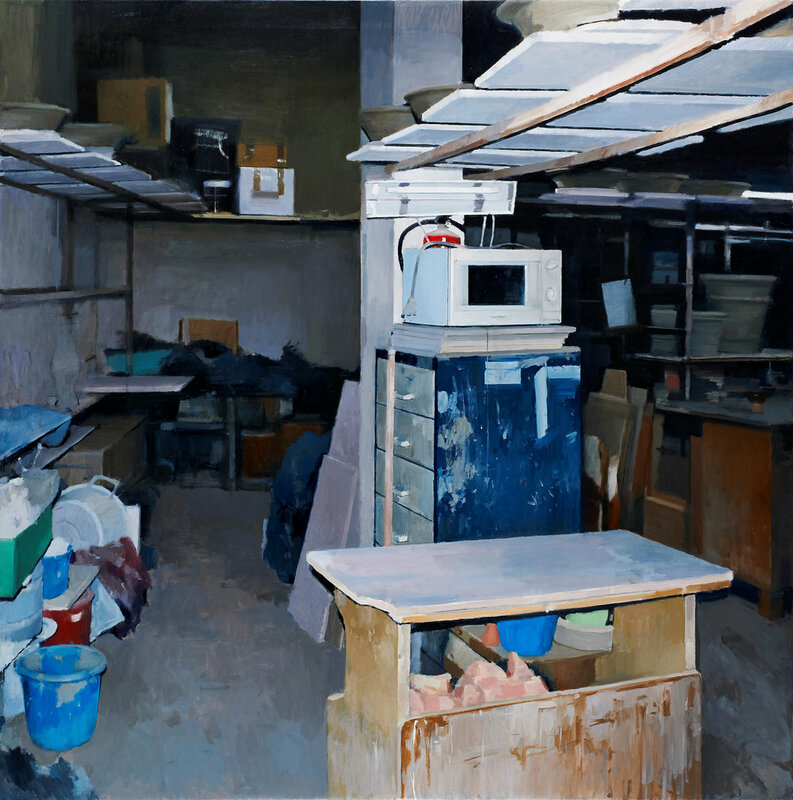 Another example of recent criticism came after Eichenberg’s painting Rubber One won first prize. The painting is indeed quite conflicting and polemic, and the internet was very harsh on the winning painting. To Infiesta it’s not relevant who wins, but that the collective overall quality of the selected pieces in the Figurativas is exceptional in its entirety. And it is. “It is very easy to criticize the winner, much harder to criticize the entire exhibition.” Still, Infiesta was surprised Rubber One won. Despite being part of the jury, he’s not there to exercise influence, instead mainly enjoying the process and listening to the opinions and discussions exchanged between the other jury members. Seeing all the art submissions also gives him the opportunity to acquire art pieces for the MEAM that may have been overlooked by the jury. He wants the exhibition to impress those who visit the MEAM and say, “Wow, I’ve never seen so much quality artwork together in one place before.” The MEAM certainly does that for me—I’ve been there three times since it opened and every single time its collection impresses me with an overwhelming sense of beauty and excellence I’ve not encountered elsewhere. It’s very inspiring to see such a great variety of realist art in such a beautiful setting, it feels like a safe zone and makes me aspire for greater heights as an artist. It gives Infiesta immense pleasure to know that the art collection will live on long after his death, because it’s part of the Foundation. The MEAM is—what he proudly describes as—a ‘little giant’ that brings together all this excellent art and connects those working together towards a shared goal of principles. He loves seeing the synergy and friendships that form and flourish between artists at the museum. 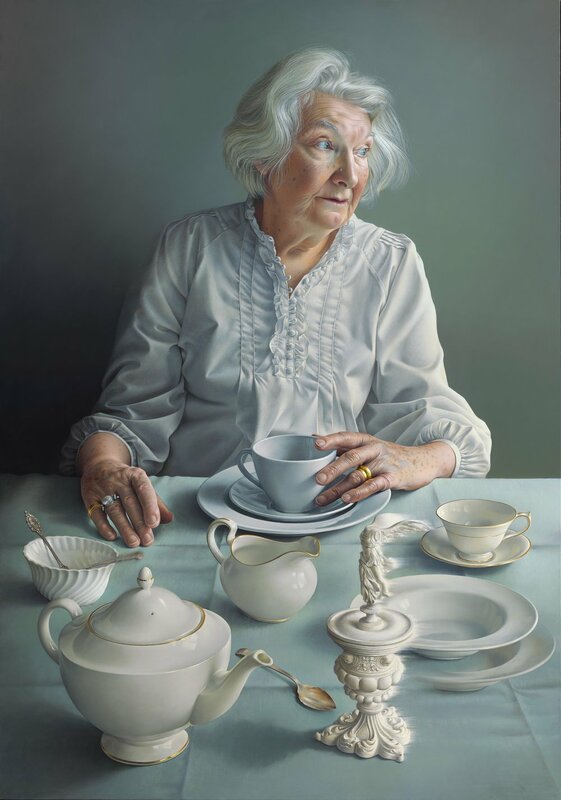 The two-yearly Figurativas competition has indeed created a new surge of public interest, slowly but surely succeeding in encouraging the renaissance of contemporary realism, and representing realist artists from across the world by giving them an essential and prominent platform. The Figurativas 17 exhibition is truly marvelous in both quality and diversity of subject matter and expression. All mediums are represented, from oils, inks, acrylics, and watercolor to pastels, graphite, and ballpoint pen. Expressions vary from ultra-smooth brushstrokes to spirited impasto, and from monochromatic to flamboyantly colorful. 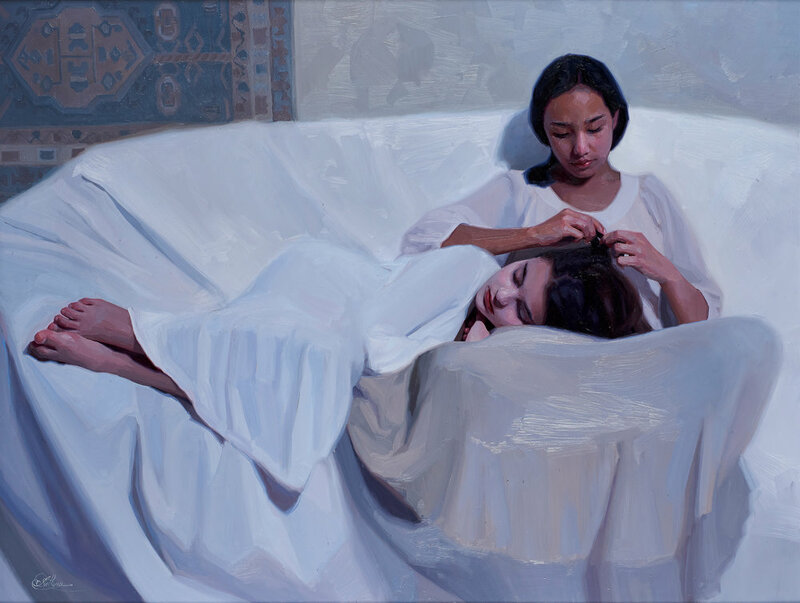 Approaches range from hyperrealism to atelier style academicism, and from traditionally painterly to innovative, pushing the boundaries of realism. The same can be said about the selection of sculptures, showing a wonderful and interesting assortment of materials, coloring, and surface finishes. Figurativas proves that today’s realism is anything except boring. 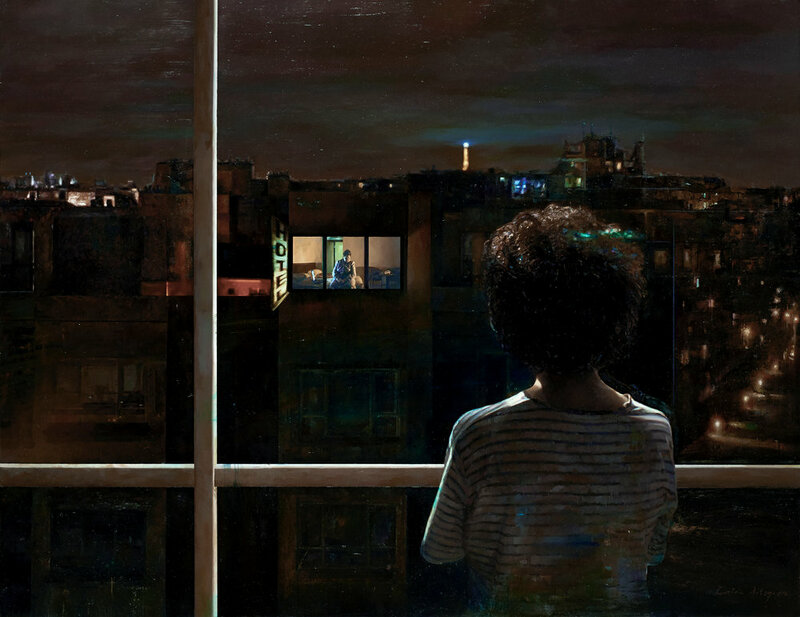 The subject matter is mainly comprised of portraiture and figure paintings and sculptures, interspersed with landscapes, cityscapes, and a few interior paintings. I was mildly disappointed there were no still lifes except for one single splendid sculpture of a fruit platter carved in Carrara marble with a bee made out of Murano glass by Italian sculptor Riccardo Ricci. Of course, many of the interior settings with human figures showed still life content. The same can be said for the lack of the wildlife and animal genres, even though some paintings and sculptures had animals in them. 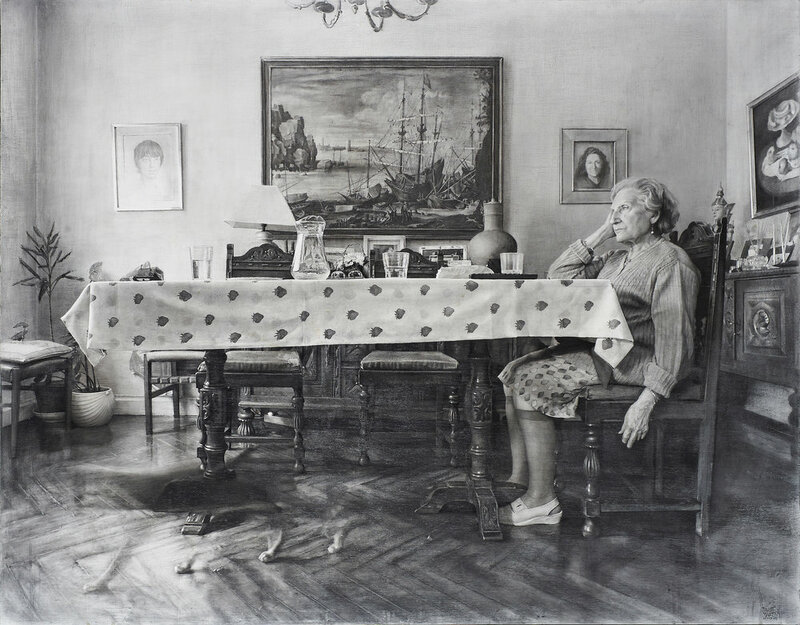 It made me wonder whether the jury was biased against these genres in general, whether the submissions had not reached the desired level of quality, or whether perhaps the name ‘Figurativas’ is confounding still life and wildlife artists into thinking the competition is solely aimed at the human figure, since so many mistakenly identify the word ‘figurative’ to mean the ‘figure’ genre instead of its intended meaning which is ‘realist’ or ‘representational’ art. The images shown in this article are of a small selection of paintings that most caught my eye, and I must apologize for not including any of the many magnificent sculptures—I would’ve gladly shown all of the work. My initial intention was to highlight a few paintings but I soon came to realize it would be impossible to describe the exhibition adequately and do it justice—I’d just end up gushing profusely. All I will say is that Figurativas 17 is one of the best exhibitions of contemporary realism I’ve seen to date. So, if you can’t make it to Barcelona before the exhibition closes on November 26th, 2017, I highly recommend you purchase the Figurativas 17 catalog. Even though it’s a Spanish edition, the mainly visual contents makes it a highly worthwhile addition to any art library. In conclusion, the biennial Figurativas Painting and Sculpture Competition is an important international player bolstering the revitalization, advancement, and elevation of excellence in fine realism. 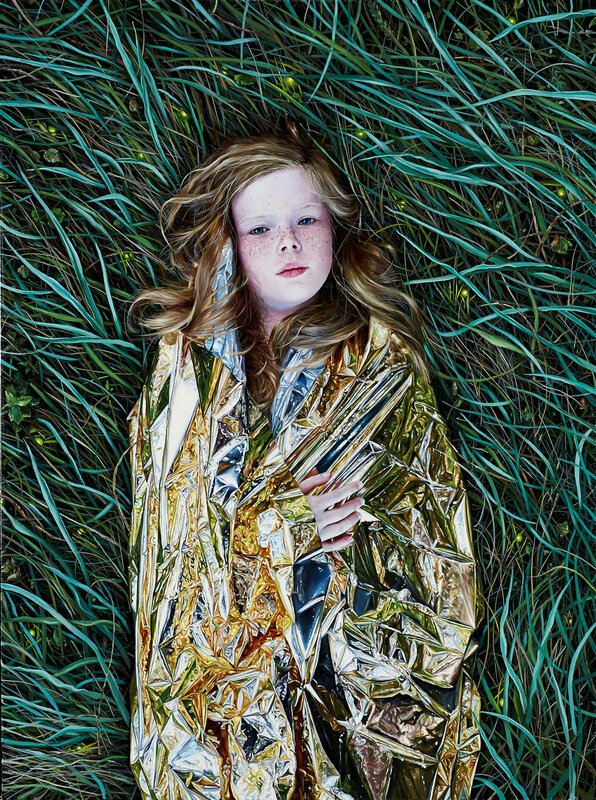 It is a testament to the strength of contemporary realism, proving it continues to be relevant, interesting, and alluring. Bravo! Visit the MEAM’s Website, or follow on Facebook, Instagram, Twitter, and/or YouTube. Visit the Website of the Fundació de les Arts i els Artistes or Arts and Artists Foundation. To see the list of artists participating in the exhibition, click HERE. To see the list of sculptors participating in the exhibition, click HERE.